Hey guys, first of all sorry for writing in english but I'm from Iceland and need some help from experienced Volvo guys, I can read swedish quite well so you don't need to reply in english. 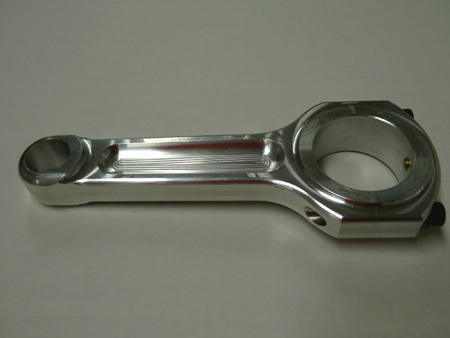 I bought connecting rods from CXRacing for a B23, the rods however were sold as B230 rods but the dimensions matched a B23 rod (145mm length, B/E bore 58mm, S/E bore 24mm, and small and big end width 29.73mm with 3/8" rod bolts). The problem lies in the rod bearings, with the B23 rod bearings seated in the tang the upper and lower shell are offset to each other and the rods seem to support wider bearings. Unfortunately I don't have pictures of our rods as the engine has been installed, however I found a picture on turbobricks of the same problem that we are having but no answers to it. Do any of you recognize this ? We saw that rod bearings for a pre 73 B18 and B20 are 27mm wide vs the B23 24mm, could it possibly be that the rod was made for those bearings ? Hi! I don´t have a B23 rod here but I have B20 pre 73 rods. The bearings are 27mm wide and the tang is 3mm in from the outer end of the bearing. But pre 73 bearing diameter is not the same as 74 and up. It looks like the conrods that KL Racing sells. The tang is placed like there would be -73 bearings in them, but the size are for 74-. A friend of mine is running with them in a naturally aspirated engine and it works. They have copied an early version of the "Xtreme" rod, as there were wrongly crafted. You can make new tracks for the tang at the other side, and just turn the rod. Yes, that sounds like a relatively easy way to make them work. I guess they will work as is also if the crank doesn´t have to much radius in thwe corners. The tangs are actually not for keeping the bearings from spinning, just to locate the bearings when assembling. Thereby there isn´t any problems just to grind new ones next to the old ones, even if they are protruding into the old ones. The bearings are kept from spinning due to high clampforce. Topfuel bearings the other way has a guiding pin in the cap to prevent them from spinning. Just grind the tang away and then make sure to fit the bearings in the center. Portning, ventilslipning, MIRA-fräsning, svarvning, montering utväxlingar, provtryckning av tryckplattor mm.